Tina Lopez's home in Waipahu is the gathering place for her family on Thanksgiving, when they prepare a feast that includes pansit, laulau and turkey adobo. "We always have company, share talk-story and eat," said Lopez, shown standing in front of her collection of family photos. 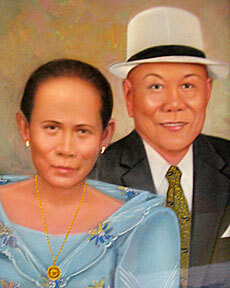 Lopez's parents, Alipia and Leopoldo Manuel, were sakadas, or Filipino contract workers who migrated to Hawaii. THIS AFTERNOON, when the kids are called in from their street football game in a Waipahu cul-de-sac, the Manuel-Lopez family will gather in the garage around a green vinyl and plywood table to say a prayer of thanks. Somehow there will be enough room on the table for large aluminum trays of turkey adobo, stuffing, rice, pansit, salad, pork and peas, ham, kim chee, takuan, oyster chicken, salt and pepper chicken, camote leaves, laulau, salad, pumpkin pie and other dishes. On the propane burners out back, a stew might be bubbling, or perhaps marunggay. A hindquarter of beef or pork will be on the kiawe wood-fired grill. The house was built by Filomena "Grandma Tina" Lopez's contractor son Franklin. It's not far from the family's former plantation home "down da lease" near the old Oahu Sugar Co. "They called it 'down da lease' because it was on leased land," said niece Charlene Cuaresma. Lopez, 80, can remember when they didn't celebrate Thanksgiving, when there wasn't always enough food on the table. "We didn't know what Thanksgiving was," she said. Her parents, Leopoldo and Alipia Lemon Manuel, came to Hawaii as sakadas, contract plantation workers, from Laoag City in Ilocos Norte. Lopez was born in Hawaii, the fifth of 14 children. Three older siblings were left in the Philippines, in the care of other relatives, when the Manuels came in 1923. In 1937, Alipia Lemon Manuel died while giving birth to their youngest child, Margaret. Tina Lopez was just shy of 13. As the oldest girl, she dropped out of school to raise her younger brothers and sisters. 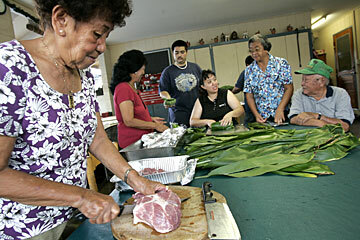 Making laulau is a family affair for the Manuel family. From left, Lori Gomes cuts meat as Marge Enriquez, David Shirota, Sandra Vidad, Marta Manuel and Federico Manuel prepare the laulau. "Whoever comes into my house will never go hungry," said Tina Lopez. HER FATHER was a hard worker but would also drink a little too much. At first, Lopez said, she didn't know how to cook. "I would burn the rice. Sometimes it would come out half-cooked; sometimes it was overcooked," she said. An aunt next door taught her how to cook and raise the infants. Lopez got married at 15. But 10 months later, while she was pregnant with child, her first husband died of a heart attack. 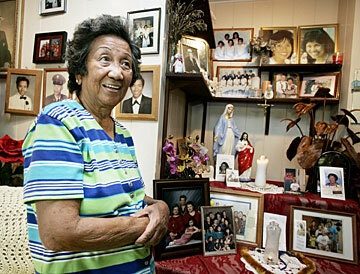 She met her second husband, Bernardino Reyes Lopez, while working at Pearl Harbor during World War II. He was a driver for the admirals. "He was the chauffeur and I was the janitress. We met and fell in love," Lopez said. 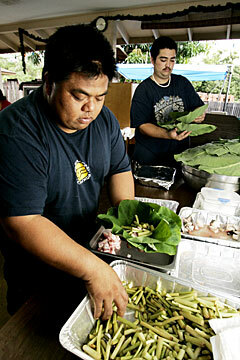 James Vidad, at left, and David Shirota prepare for today's Thanksgiving dinner. The year she married, 1943, was the family's first Thanksgiving. Lopez's younger sister Margaret learned about it at school and brought home Thanksgiving drawings. Lopez remembered cooking the turkey and the family sitting down for a meal. The three-bedroom home built by Lopez's husband was often crowded, Cuaresma remembered. Lopez took in children and others who needed a place to live. When Cuaresma's mother died of cancer, Lopez helped raise Charlene and her brothers and sisters. CUARESMA REMEMBERS that some nights, 30 people or more slept on ikamin mats on the floor and in the garage, boys in one room and girls in another. "Marunggay was a staple," Cuaresma said. The soup made with leaves from the marunggay tree, other vegetables and chicken could be stretched to feed more people by adding more water, leaves and greens and cooking more rice. "We were poor," said younger sister Lorencia "Lori" Gomes. "My sister said if I get married, she's not going to starve her children. There's always going to have food on the table." "Whoever comes into my house will never go hungry," Lopez said, repeating a family mantra. 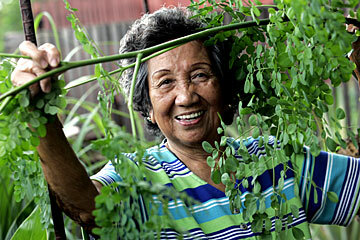 Tina Lopez picks marunggay leaves, which are used in a soup. "He (Bernardino) was a good man, a good provider," the youngest sister, Margaret, said. "All the people you took in, all the extra mouths, he never complained." A picture of Bernardino shows a handsome, snappy dresser in a suit and tie next to a upright bass that he played in the Sonic Orchestra, a local big band that played clubs on Hotel Street, banquets and hotels. The picture is in a corner of the house, with other photographs of family members: Lopez' daughter, Vivian Acol; four sons -- Bernardino Jr., Franklin, Michael and Clayton; her parents; a family picture of the brothers and sisters all dressed up; the 12 grandchildren and 27 great-grandchildren. Next to the pictures is a beautifully carved anthurium. Bernardino worked at the House of Monkeypod, making sculptures out of wood. "It was his pride and joy," Lopez said. Ceramic statues of Jesus and the Virgin Mary are in a corner, and a candle burns for relatives who have died. "I light the candle so they can find their way to heaven," Lopez said. "We were married 58 years," Lopez said of Bernardino. "He was 95 when he died on Thanksgiving Day. That was four years ago." It was about 8:30 at night, after most of the family had gone home. "It was peaceful," Lopez said. "He died in my arms." ONE OF HER sons recently called, offering a plane ticket so Lopez could spend Thanksgiving on the mainland with them. She said, "No, thank you." "We have to have Thanksgiving here," Lopez said. That way, her husband's spirit can be with them. On a recent Sunday, family members were at the house making laulau, which would be stored in one of the five freezers in the house until it is ready to be steamed and served today. Lopez wore a clean, blue apron. "I'm the boss," Lopez said. Granddaughter Sandra Vidad, her children and Lopez's sisters and sister-in-law wrapped the luau leaves, meat and fish; Lopez watched to make sure everything was done right. 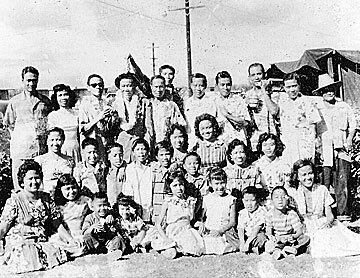 The Manuel family poses for a portrait in Waipahu in 1959, when Leopoldo Manuel retired. There are no recipes written down. Lopez learned how to make other ethnic dishes from co-workers at Big Way Supermarket. "You have to put your taste into it. Taste good or no good. You have to know your taste," Lopez said. SOMEONE IS coming over to cook almost every weekend. And there's at least one party a month. At the Lopez house, the Christmas lights are always up, and the metal pole for firecrackers on New Year's Eve never comes down. "We always have company, share talk-story and eat," Lopez said. Her sisters come over to help cook or to play cards. "They like to talk about the old days," Vidad said. Older brother Fred Manuel, who came from the Philippines in 1946, and his wife, Marta, will celebrate their 50th wedding anniversary in January. "We should have a party here," Lopez tells her sister-in-law. "If you have it at a restaurant and you make a reservation for 100 people, if only 50 people show up, you still have to pay for the other 50." "We're going to cater the food," Lopez concludes. Vidad rolls her eyes. It's a family joke. "Cater means we'll cook," she said. "We're catering from Tina's kitchen." On Thanksgiving the cooking starts at 4 a.m. It's a family affair. Everyone has a job, from chopping, grilling meat, wiping the table to cleaning up afterward. The youngest kids reflect the variety of food on the table. Besides Filipino, they are Portuguese, Japanese, Chinese, Samoan and haole. "When we make party, everybody gets their own food," Lopez said. "I call my menu international menu." Most of the great-grandkids run around and play, but in time they will take their place in the cooking line. "Just today my great-grandson said, 'Grandma, what is Thanksgiving?'" Lopez said. "The Pilgrims came from far, far away," she told him. "They planted corn and vegetables just to survive. ... The Indians were their friends and hunted turkeys. "They were thankful for being together," Lopez concluded. "They never starved." LITO ALCANTARA: President, Group Builders Inc.
FORTUNATO TEHO: Agriculturist and author of "Plants of Hawaii"
16 PERCENT: Or 18,681 people, were in "office and administrative support occupations," including bookkeepers, secretaries and clerks. 12 PERCENT: Or 14,069 people, were in production or "material moving" jobs. 12 PERCENT: Or 14,072 people, were in sales. 11 PERCENT: Were professionals, including 4,235 health care practitioners, 3,633 in education, 1,154 in architecture and engineering, 1,129 in community or social services, 781 in computers or mathematics and 427 in legal occupations. 11 PERCENT: Or 13,419 people, were working in building and grounds maintenance (13,419 people). 11 PERCENT: Or 12,917 people, were in food preparation and service. 9 PERCENT: Or 10,450 people, were in construction. 7 PERCENT: Or 8,618 people, were in "management, business and financial operations," including 566 top executives, 441 financial managers and 1,445 accountants or auditors. * Does not add up to 100 percent because not all occupations are listed.